The Feria del Caballo or Jerez Horse Fair is a world-renowned celebration of the horse, a festival held in a city in the South West corner of Andalucia, Jerez De La Frontera. The festival is steeped in history dating back over 500 years to 1264 when Alfonso X ‘The Wise’ took over the city and granted two annual duty-free fairs as a commemoration of the conquest. These fairs took place in April and October. By the Middle Ages the festival in April had transformed into an occasion where herders and farmers would bring livestock into the city. In 1955 the Domecq Sherry family proposed the idea that the festival should be a celebration of the prominent place of the horse in the city, the tradition of which has been upheld to this day. Originally the gypsies would come and entertain the crowds with their horses at the Jerez fairs and this is how they would make their money. But now the Feria del Caballo attracts thousands of visitors from around the world every May, drawn by a variety of fascinating events. The festival is held this year from Saturday 5th – 13th May 2018. Held in the Gonzalez Hontoria park and covering 52,000 square metres there are outstanding displays of horsemanship in many forms. You will witness Doma Vaquero and Doma Classica – cowboy and classical dressage, riding competitions, polo and carriage driving. There are also flamenco displays, bullfights, fun fairs and over 200 casitas which is the Spanish equivalent of the Fete marquee. There is traditional Spanish food available as well as lots of local sherry to enjoy! 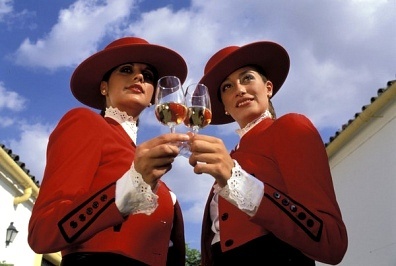 During the festival, Jerez is taken over by bewitching horses strolling elegantly down the streets ridden by immaculately clad aristocratic looking men & beautifully dressed women. The women sit behind them riding side saddle looking perfect & poised on the rump of the horse. Not only will there be Spanish style carriages but there are also English, Hungarian and Russian all exquisitely decorated as they parade through the old cobbled streets. 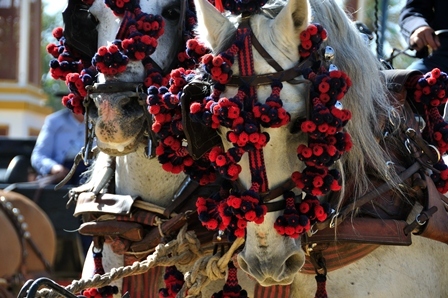 Jerez Horse Festival offers Andalusian Chic at its most beguiling. When night falls on Jerez the small town alights with guitar rythms, flowing wine and veracious flamenco dancers often stomping their dainty shoes and swishing their flowing skirts into the early hours of the morning. Local residents embrace the occasion, often joining in with delighted tourists who are completely entranced by this mesmerising town and all it has to offer over these joyous few days. Over the course of the festival you can experience a memorable show known as the ‘Como Bailan Los Caballos Andaluces’ which translates to ‘How Andalusian Horses Dance’. The riders and horses alike wear full costume performing in breath-taking unison wowing the spectators of all ages. It is also possible to tour the stables and museums which display carriages, tack and harnesses, blacksmithing and equestrian art. And for those who want to fully immerse themselves in the culture there is the opportunity to take part in the famous sherry tasting tour at the Sandeman Bodega. Julia - I was handed the task of booking an “unforgettable equestrian vacation” for my boss and his wife for her 45th birthday. As I am not a travel agent, I sceptically researched a number of different companies on-line, and ultimately decided to book with Equestrian Escapes; and I couldn’t have made a better decision! Equestrian Escapes custom made exclusive getaway was easy to book as they took care of every single detail, and more importantly for me, my boss and his wife had the most amazing and unforgettable time! I would strongly encourage anyone looking to book an equestrian vacation to put your trust in this company, as they are organized, trustworthy and simply exceptional at what they do. To enquire about your trip to the Festival Of the Horse in Jerez visit the website or call 01829 781 123 to speak to our equestrian experts.